If you’ve come here in the hopes of getting the ultimate solution to search engine optimization, and the “secret” to ranking number one – you’ve come to the wrong place. In fact, no matter where you go, you will have come to the wrong place, because in SEO, there is no such thing. Unless you land on a scam website. Because then they’ll convince you that you’ve come to the right place. You can spend thousands of dollars on Google ads to get more traffic by getting your website displayed at the top, but did you know that you can learn SEO and implement those strategies into your own website and get it displayed at the top completely free? In this article, you’ll learn 5 small SEO tips that you can implement to your own website to make for big results. Many bloggers believe that SEO is about stuffing headlines, titles, and sub-headlines with keywords – and for ranking at the top, it was! 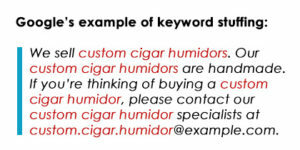 Here’s an example of keyword stuffing from Google. Not very pleasant to read, right? Another misconception is that you write blog content for Google, but that is also not true. When you write, you write content for your readers, and if you’re able to produce content they enjoy, you’ll start seeing results. People go to Google to get answers to their questions. Therefore, your content should be written in a way that targets your audience’s common questions, and then answers them. Because what will happen if they can’t find an answer to their question quickly? They’ll bounce off your site, increasing your bounce rate. When your bounce rate increases, Google says “Hey, it seems like people can’t find what they are looking for since people are leaving the site right away. Maybe we should change the position of the site and rank it lower because it isn’t as relevant as other sites”. When writing blog posts, the golden rule is always to write for the reader first, and Google second. Don’t ruin the reader experience by stuffing your post with keywords, for example. If your visitors are happy, Google is happy, because they want their user experience to be good, right? Right now, the single most powerful search engine ranking factor is backlinks, according to Moz. Since backlinks became recognized as a major ranking factor in Google, people have tried it all. From creating website directories to buying links to using comment bots. People have really tried everything. As with everything in the early stages, Google didn’t have as much control of the links that pointed to a website as they have today. Eventually, search engines started to penalize and ban sites that were using spammy backlink-building methods, thus forcing SEO experts to be even more creative to improve ranking. Today, there are very few effective “spammy” link building methods that work. And if they do work, Google will soon find out and penalize your site for it. There is no secret the backlink building. However, there is something that is always relevant no matter what you do, and that’s building relationships. People don’t link to sites that beg for links, nor do people link to sites that produce low-quality content. People link to sites they trust. Those who are most likely to link to your articles are the people who are within your target audience. First of all, you want to begin identifying the people who are within your industry. A simple Google search will give you a lot of sites that you can engage with. Try to simply search for your keyword plus the word blog or website. Now, create a list of all the websites you find. After that, it’s time to start engaging with them. a very effective way to get recognized by them is to start commenting on their posts. However, avoid being self-promotional and don’t beg for links the first thing you do because that will only make you a spammer in their eyes – and they’ll ignore you. Look at providing value and interesting points of views from their articles. Social media is also a great place to start engaging with them. Follow them, like their posts, and add value to whatever they are posting. Once you’ve built a name for yourself and they recognize you, you can email them, asking for a guest post on their site, or let them know about your blog post through a comment that they could link to. Just make sure that you are always providing value because this will let you build genuine relationships that last. When you’ve built relationships with valuable resources in your industry, there are literally hundreds of different ways you can benefit from each other. Why not write a guest post together and link to each other, or let each other post on each other’s websites regularly etc. When people know you, they are much more likely to help out and listen to what you have to say. Articles and blog posts are great, however, there are things that generate far more backlinks than that type of content. Linkable assets as it is called is creating content that people can’t resist but to use on their site. Linkable assets are fun and engaging content that is so valuable that everyone links to it on their sites. Creating these often demands more resources than your normal blog posts, but their return on investment is far greater. You can see all of the major sites such as SproutSocial and Buffer putting great effort into creating linkable assets such as infographics – and that’s because they work! Create high-quality linkable assets and reach out to some resources in your industry letting them know about it and you can be sure you’ll gain traction from it. Once you’ve built your authority in your niche, people will automatically share them without you asking. We spoke about the importance of sharing killer content, and content that is designed for humans. To build authority and trust, the content on your site needs to be credible, and you need to have expertise on the topic you are covering. Some people tend to mistake credible content for being written by a well-known person, however, credible content doesn’t necessarily have to mean that it is created by a trusted person. One very effective way to get your content to become more authoritative is to back it up with facts and statistics. If you are throwing out statistics and numbers without backing them up with the source, people won’t trust you. In fact, it will seriously harm you and your website’s trust as well. If you are sharing more in-depth content than those ranking higher than you, and those that are already written by an authoritative source, while also backing your facts up with proof, you might be able to outrank them, significantly increasing your authority. If you are ranking higher than some of the thought leaders and trusted individuals, you’ll automatically gain some of the trust that comes with being in their company. While it is difficult to outrank them, constantly learning and implementing the latest SEO facts, while also creating killer content certainly won’t harm you. As a less authoritative website in your industry, it is difficult, if not impossible to rank for the broad search terms, because these are already targeted by the big guys in your industry. Long-tail keywords are often referred to as crumbs in search engine optimization and website traffic because essentially, the long-term keywords are words with much less search traffic than the broader search terms. Nobody wants to have the crumbs, right? But let me tell you, they’re delicious if you scrape some together, because eventually, you’ll have a whole loaf which is a lot of traffic. 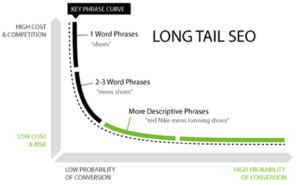 Long tail keywords are three and four which are very, very specific to whatever you are selling. Long-term keywords are especially beneficial for businesses because when a customer uses a highly targeted search term, they know exactly what they are looking for and are ready to buy. This means that the traffic you’ll get from long-tail keywords is extremely valuable because they are very likely to convert. Keywords are generally divided into three categories. When people search for the broad one keyword search, they are usually just browsing around, checking for inspiration. An example of a broad keyword is shoes. When people are searching for shoes, they are not likely to convert because they themselves don’t know what they are looking for. The next category is the “medium targeted keywords”. Here’s where it gets a bit more specified, however, it’s still fairly broad. Medium keywords can be words such as “Men’s shoes”. If your website can provide what they are looking for, chances are they’ll buy from you! 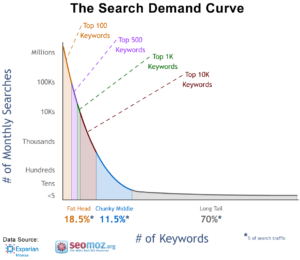 Want to know why long-tail keywords are so important? Because they make up 70% of Google searches! While each long-tail keyword is far less searched for, they are easy to rank high on, and if you can acquire a top spot on a few of them, it’ll add up to quite some significant traffic numbers. Thanks for these awesome tweaks. But there are plethora other factors which need to be considered. These tweaks you mentioned works for Authors and Guest Posters. Really I used long tail keywords into my website, and search result incresed to 30-40%, Thank you for share the information to us.